Yesterday I told you about my cleansing routine, now here's what I follow up with. I should have told you yesterday that I don't cleanse in the morning anymore. I know, what a shock. While my skin was really bad a few months ago, I heard somewhere that cleansing in the morning was just destroying the skin barrier that had repaired itself during the night. I'm not too sure about the science behind that but I decided to give it a try, and now my morning cleansing consists of wiping away the night with an alcohol-free toner (La Roche Posay Physiological toner, mostly) and a spritz of Avene Spring Thermal Water. It brings just enough moisture for now, doesn't leave me greasy and preps my skin beautifully for makeup. A no-brainer. I don't know yet what to replace it with for colder months, when the tint in it makes it too dark for my pale skin. The good old Estee Lauder Advanced Night Repair Serum. 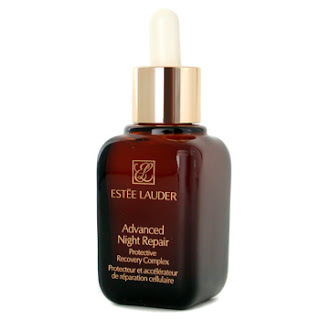 I may alternate with another serum later in Fall (a Vitamin C one for example) but this is always a great choice as it does so many great things for the skin. I then follow up with a basic moisturizer. This is currently Louis Widmer Switzerland moisturizing fluid. 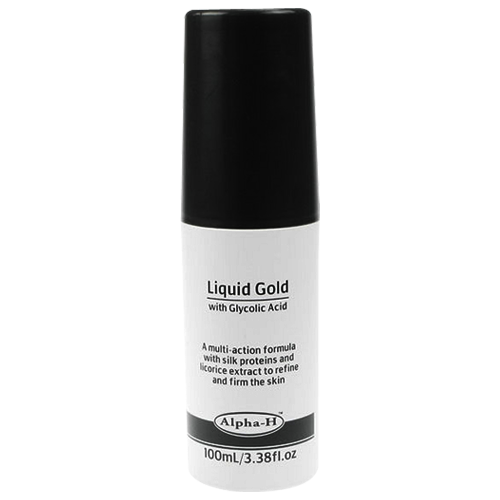 The famous Alpha H Liquid Gold. Now this deserves all the good things I've heard on it all around the beauty blogosphere! It's a very liquidy lotion that contains 5% glycolic acid. You pour it on a cotton pad and wipe it all over your face (not around eyes, though). It stays tacky for 5-10 mins while it sinks in. It can tickle a little bit too but I noticed that it mostly did the first time for me, then not anymore. You should use this on its own, and every other night at the most. I chose to use it 3 times a week, as my skin can be a little bit sensitive. If you're even more sensitive than me, you can add moisturizer on top when your skin has absorbed it, but ideally you should use it alone: nothing under or on top of it. I make sure I do not use this on nights where I've used the Osmoclean, as that would be too much exfoliation. What I find works particularly well is to use the Osmoclean the day after I've used Liquid Gold, this way I get chemical exfoliation from the glycolic acid, then a bit of mechanical exfoliation for any dry patch that wouldn't be gone yet. Also, the Liquid Gold would dry up any little whiteheads, and the Osmoclean would exfoliate the dead skin the next day. 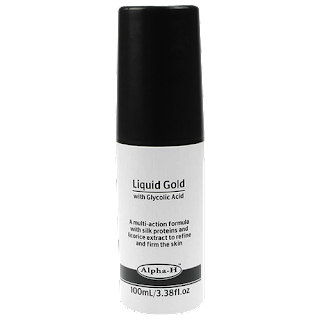 Liquid Gold isn't a cheap product (around the €35 mark) but it's the cheapest in the Alpha-H range and in my opinion, the one that you need. Like for cleansing, I find this is a very minimal routine in terms of the amount of products I use, but it's a very effective one. The Liquid Gold has definitely added something to the routine, but I also know the good old favorites are doing a good job at keeping my skin soft and moisturized. All in all, I don't think I've ever had a skin that clear, and I have been wearing little to zero foundation for the past month, which says a lot. I would never have thought this was possible, especially not with years going by - so this is the proof a good skincare routine really does a huge difference. Even if I have never tried the Liquid Gold thing (it doesn't exist on the Romanian beauty market)I believe it's quite similar with Paula's Choice' Resist Daily Smoothing Treatment with 5% Glycolic Acid. I used some samples and I think it's really a great exfoliating product. I also use the 2% BHA exfoliator which is effective in cleaning pores and preventing blemishes. I cleanse morning and evening (and since taking more care of my skin, it has become a lot more normal and luminous (it used to be combination/oily at 37, using a gentle water-based cleanser (I have been using one by Eucerin, DermatoClean for several months and I have just bought the Bioderma's DS+ Gel Nettoyant Apaisant. Since I usually apply facial oils in the evenings (Rosehip, Jojoba and Borago oils)I find it necessary to also cleanse in the morning. Plus I feel that the moisturizer sinks more easily. The best body scrub in the world.